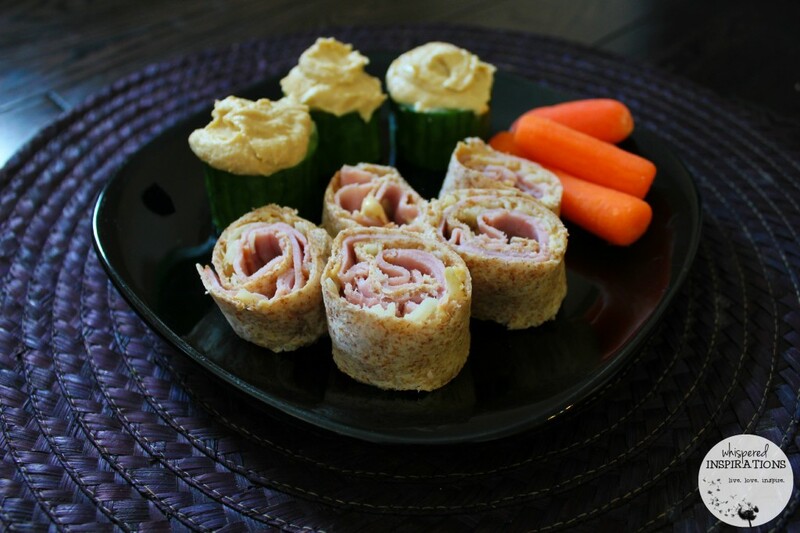 You are here: Home / Recipes / Appetizers / Kid-Friendly Hummus Recipes: Hammy Hummus Pin Wheels & Cucumber Hummus Boats! Get the Kids in The Kitchen with The Help of Sabra Canada! With Spring Break just ending for us and for some, it is around the corner–it can get busy at home. With the polar vortex and the high temps and then the huge dips makes for a lot of time indoors. What better way than to teach your kids good habits and useful lifelong skills than to keep them busy in the kitchen? Why not go further and have them make HEALTHY eats? Dipping is a great way to introduce flavourful foods like salsa, guacamole, and hummus to a finicky eater’s diet, and having kids “cook” their own snacks and meals is a terrific way to spend time as a family. Plus, it gives them a creative outlet and something to do that’s enjoyable for all! I admit, my kids can be picky when it comes to trying new things. One thing that I discovered when Sabra asked me to try out some of their amazing products is that their palates are already expanding. If you know Gabby, you know that she loves cooking and best of all learning new things in the kitchen. Little did I know was that she already LOVED hummus and had eaten it with her Aunt many times and even at school. Definitely a pleasant surprise to me and my Hubby. Sabra’s Classic Hummus combines fresh chickpeas with a touch of garlic and tahini (ground sesame seeds) to create a smooth and creamy spread. It’s as healthy as it is delicious (which is to say, very). 2 tbsp. contains 70 calories and is low in sodium. The recipes above were made entirely by Gabby, who is 10, with my supervision. I am proud to say that she made these on her own and was over the moon to be able to make them herself. Gabby decided to make Hammy Hummus Pin Wheels and Cucumber Hummus Dip Appetizers for herself and us too. It was the perfect finger food with a healthy starch, dairy, protein, fat, and fiber. We had a good time and not only did she make a healthy snack, she felt self-accomplished and I taught her how to properly use a knife and we had a little bonding time. Get the Kids in The Kitchen with The Help of Sabra Canada and make these Kid-Friendly Hummus Recipes! They will love making AND eating these super easy recipes! Spread hummus all over tortillas. Top with shredded cheese of choice. Overlap two pieces of ham or turkey and cover tortilla. Begin rolling until tortilla becomes a roll. Cut ends off and discard (or eat). Continue cutting into thicker slices, serve, and enjoy. Wash your large cucumber and trim ends off. Discard. With a spoon, scoop out the center. With a spoon, scoop in hummus into a small heap. Serve with baby carrots or sliced carrots and enjoy. The Hammy Hummus Pin Wheels are made with whole wheat tortillas, fat-free Mozzarella cheese, pepper to taste and Sabra Classic hummus. The Cucumber Hummus Dip Apps are an edible bowl to enjoy your Sabra Classic hummus in, then–you eat the bowl. Don’t forget the baby carrots to dip. It made for a nice refreshing afternoon snack on a cold and dreary day. Let me tell you, these did not last long in our house. I think I have a Hummus monster because it’s all gone! These recipes were super easy and required very little supervision. I just helped Gabby wash the veggies and guided her with the knife, she did everything else as you saw in the video! Get the kids busy and get them involved in the kitchen. They feel accomplished and you are teaching them valuable lessons that they will use for life! With these super easy and kid-friendly hummus recipes, you’re set to go! Want more easy and kid-friendy hummus recipes, check out this Mac and Cheese! Go to sabradips.ca for more FUN recipes, list of products and much more! You can also follow @SabraCanada on Twitter and like them on FB, here. 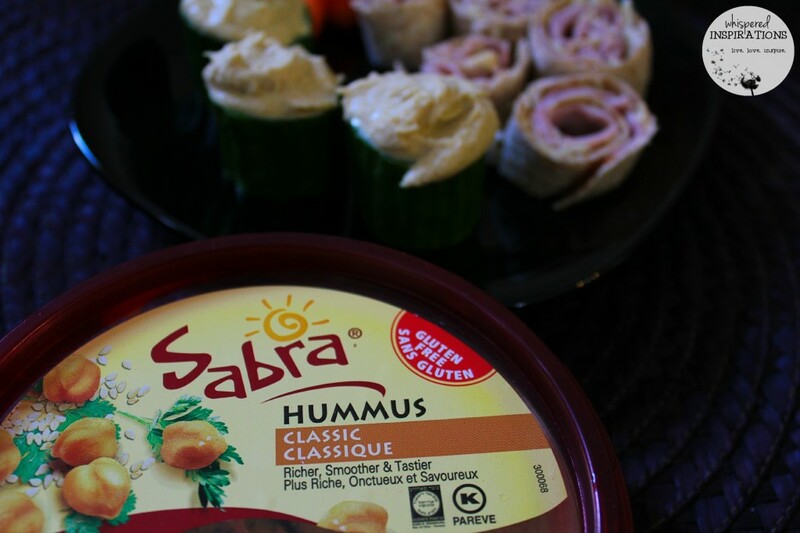 Which Sabra Canada product would you most like to try? Would love to try the Southwestern style Salsa!! Would love to try the Classic Salsa! I absolutely love Hummus! I never thought to put them in a pinwheel! hmm, sounds delicious. Spinach and artichoke is my favorite. . Would love to try the roasted red pepper also. Thank you for the giveaway. I need to try this and see if my kiddos will eat this! My daughter just loves hummus. I never thought to put it on cucumbers though. Have to try that. The spicy hummus. We love Sabra! We make roll ups like this sometimes too. They're easy enough for the kids to make by themselves so they are great snacks. The Supremely Spicy Hummus has my name all over it! The Spinach and Artichoke Hummus sounds really good! It's nice to see such a variety. My family enjoys hummus and those pinwheels look like a yummy snack. We love hummus! The baby will lick the hummus off the pita chip and hand it back for more! No concept of double dipping! Let them, they may just like it! I love hummus and need to get on another hummus kick! It's so good for you. Get him in the kitchen, maybe he will give it a whirl. Hummus and cucumbers is one of my favorite snacks. I love your choices here, too. YUM!!! I most want to try the Spinach and Artichoke Hummus because it's the only one I haven't yet tried! I love hummus and my favorite is red pepper hummus. I would love to make it myself. I love hummus, and I have to say your daughter was an ace in the video. She did a great job! The roasted garlic hummus. Its my favourite. I'm not a hummus fan, but these recipes sound like something I might like. I'll have to give them a try. Those look delicious. I love hummus for the extra punch of protein and am always looking for new ways to include it in my cooking. You know, I have only tried Hummus once or twice in my life and I can't remember if I liked it or not. I like chickpeas, though, so I probably do. Well, i have already tried all of their products, but love the different hummus flavours the most! I would love to try the spicy hummus. My daughter just loves hummus, and I love that this is a good for her snack. I would like to try the Pico De Galo Salsa. I love garlic so i would like to try the roasted garlic. Hummus. I'd like to try the Sabra Greek Olive Hummus, I haven't seen that one before. we at tons of hummus and this is one of our favorite brands. i love that my kids love it to. My recent post #PowerToKids With The NEW Philips Sonicare for Kids! I’d like to try the Spinach and Artichoke Hummus. I love hummus so much! My kids however do not, but I'm sure I could sneak it by them with these recipes! Definitely in the pin wheels. You can use it as a mayo substitute. Mmm I love the plain one best! Yay sabra! I would love to try the supremely spicy hummus! Yummy! LOL, so cute! That is amazing though, my kids love meat too much but, I love it when they choose healthy snacks. My son would love those rolls! Yum! So easy and kids love finger foods. I am going to buy the individual ones too, that way I can throw them in there. Gabby is obsessed. I want to try the Chunky Pico De Gallo Salsa..yumm! I've tried most of them but I've never seen the Spinach and Artichoke in store so I'd love to try that. I love hummus. Those rollups look so yummy! Spinach and artichoke hummus sounds delicious! I'm a huge Sabra fan, love all the varieties but Roasted Red Pepper is my favorite. Cool ideas for getting the kids to enjoy the goodness. I would love to try the roasted garlic hummus! I've never served this to my kids, but this would be fun to try! The Southwestern Style Salsa sounds amazing! It would be great to win the Sabra Canada Prize Pack. Which Sabra product do you MOST want to try? I would like to try the Roasted Pine Nut Hummus. We like regular Hummus so this flavour just seems to be a deluxe version. Green Olive Hummus — yum!! I recently tried Sabra hummus for the first time and I loved it! I so want to try the roasted red pepper Hummus! Great products my family would love! I want to try the roasted garlic. I'd love to try the Roasted Pine Nut Hummus. sounds delicious, but not one I'd normally think to pick up and buy. Not even sure if it's one i've ever seen before either. I’m most interested in trying their classic salsa. I just tried hummus last year for the first time and loved it. I don't think my kids have ever tried it. I'd love to try the Greek Olive Hummus, I've never even heard of that! I think we'd love to try the Supremely Spicy Hummus. I'd try the "Southwestern Style Salsa." I want to try the spicy hummus. I love anything spicy! I would like to try the Greek Olive Hummus. I'd like to try the roasted garlic! The roasted red pepper hummus sounds good! I want to try the roasted red pepper hummus. I love roasted peppers so I know I'll love that! I really want to try the Spinach and Artichoke Hummus. My whole family loves hummus and it is such a hit a games nights etc.. I want to try the Southwestern Style Salsa. I'd like to try the Roasted Red Pepper Hummus. I have tried different flavors and it’s hard to choose we loved them all!